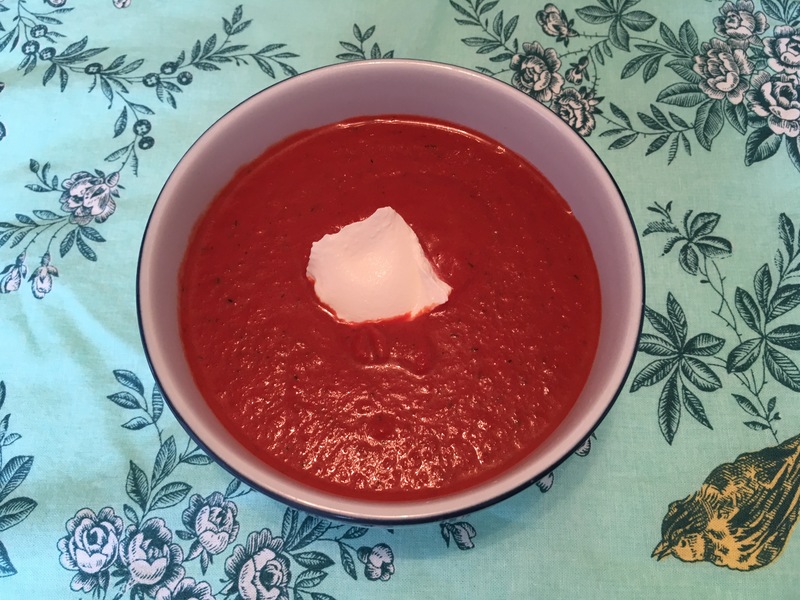 This cold summer beet soup is light and flavorful. I use the same technique of shredding the vegetables as I did for the previous post on zucchini soup. You can serve it plain or with a little sour cream or yogurt. It may not be authentic, but it is comforting on a hot summer day. Begin by shredding the onion and garlic in the food processor. Heat canola oil in a 4-quart pot on medium high heat then scrape the shredded onions into the hot oil. Let cook for 5 minutes. Add celery. While the onion and celery are cooking, shred together in the food processor the beets, carrots, kohlrabi and fennel then scrape them into the sauteed onions and celery. Add salt and pepper to taste then lower the heat slightly and let cook about 8-10 minutes until the vegetables begin to soften. Add stock, fresh parsley and half of the dill. Cover and simmer about 15 minutes or until the vegetables are soft. Let cool a few minutes then add the remaining fresh dill. Purée in a blender in two batches. Serve cold with a dollop or two of sour cream or yogurt if desired. Serves 4. This entry was posted in Appetizers, Soups, Vegetables, Vegetarian. Bookmark the permalink.